Do you know that you can create scripts using cmdlets that are provided with SCVMM 2008 to manage your VMware environment ? For example, you can use the Add-VirtualizationManager cmdlet to add a VirtualCenter Server. # Description: Adds a VMware VirtualCenter Server to VMM. # Connect to the VMM server. # Require user to accept the certificate before adding the VirtualCenter Server. Write-Host "Following is the certificate information for this VirtualCenter Server:"
$AcceptCert = Read-Host "Do you accept this certificate? If you accept, enter Y." # Add the Virtual Center Server. Write-Host "The script cannot continue unless the certificate is verified. Ending script." After you add the VirtualCenter Server, you can manage the VMware ESX Server hosts. 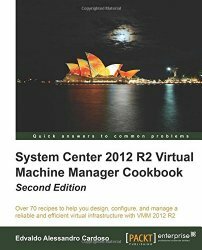 The following list summarizes the new and updated cmdlets and parameters in VMM 2008 R2. This cmdlet places a VMM host into maintenance mode. For more information, see Maintenance Mode for Hosts. This new cmdlet removes a VMM host from maintenance mode and returns it to service. For more information, see Maintenance Mode for Hosts. You can use the AllowUnencryptedTransfers parameter to specify that network file transfers into or out of a library, or into, out of, or within a host group, do not require encryption. Allowing unencrypted file transfers can improve performance when neither the source computer nor the destination computer requires encryption. This parameter can be used with the Set-LibraryServer and Set-VMHostGroup cmdlets. You can use the BlockLMIfHostBusy parameter of the Move-VM cmdlet to stop Hyper-V live migration from attempting to restart a live migration that could not previously start because the source host or the destination host was already performing a live migration. The LimitCPUForMigration parameter limits the processor features for a virtual machine so that the virtual machine can be migrated to a different physical computer that has a different version of the same processor as the source computer. Migrating virtual machines between physical computers with processors from different manufacturers is not supported. This parameter can be used with the following cmdlets: New-HardwareProfile, Set-HardwareProfile, New-VM, Set-VM, and Set-Template. When you place a host that is a member of a host cluster into maintenance mode using the Disable-VMHost cmdlet, and you use the MoveWithinCluster parameter, all the virtual machines that are currently deployed on the host will be migrated to another host in the same host cluster. You can use the RemoveLibraryStoreSharePath parameter of the Set-VMMUserRole cmdlet to clear the path to the specified library share. This share is used by members of a self-service user role to store virtual machines or as a repository from which to deploy stored virtual machines or stored ISO images. When you use the RetainDeletedObjects parameter with the Get-VMMServer cmdlet, the objects in the cache that are marked for deletion will be preserved. This parameter is included for users who might develop a user interface. When you use the RetainObjectCache parameter with the Get-VMMServer cmdlet, the objects in the cache remain in memory and are not reclaimed by garbage collection. This parameter is included for users who might develop a user interface. The UseCluster parameter lets you force the transfer of a virtual machine using Windows Server 2008 Cluster Migration, even when Hyper-V live migration is available, when you move a virtual machine using the Move-VM cmdlet. For more information, see Live Migration. The UseLocalVirtualHardDisks parameter specifies that the virtual hard disk file (.vhd) for a new virtual machine that is created by using the New-VM cmdlet is at a specified location on the destination host, and that no .vhd files will be copied from the library. 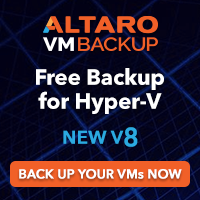 For more information, see Rapid Provisioning of Virtual Machines. The VMNetworkOptimizationEnabled parameter enables virtual machine network optimization detection. This feature improves network performance for virtual machines with network adapters that support virtual machine queue (VMQ) or TCP Chimney Offload. VMQ enables creation of a unique network queue for each network adapter. TCP Chimney Offload enables network traffic processing to be offloaded from the networking stack. This parameter can be used with the New-VirtualNetworkAdapter, Set-VirtualNetworkAdapter, New-P2V, and New-V2V cmdlets. You can use the VMWarePortGroup parameter to specify a VMware port group. As you may be aware, late last week we get noticed that a vulnerability in Internet Explorer has been associated with the recently publicised attacks against Google.
. There have been a very limited number of targeted attacks against a small number of corporations.
. Attacks seen to date are only effective against Internet Explorer 6.
. Attacks are NOT widespread.
. Thus far we are NOT seeing attacks focused on consumers. It is important to note that all software has vulnerabilities and switching browsers in an attempt to protect against this one, highly publicised, but currently limited attack can inadvertently create a false sense of security. Moreover, IE8 has built-in security features, such as the SmartScreen filter, that other browsers do not have. These features protect against real threats to consumers, such as socially engineered malware and phishing attacks. We strongly recommend those using Internet Explorer 6 or Internet Explorer 7 upgrade to Internet Explorer 8 as soon as possible to benefit from the improved security protections it offers. IE8 can be downloaded here. Recomendation : those using Windows XP SP2 upgrade to Windows XP SP3.